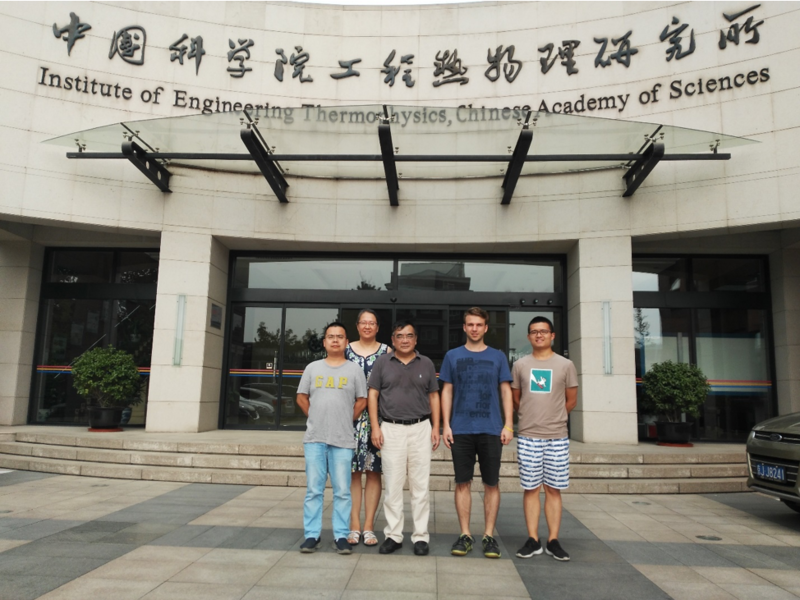 At the end of June, Ph.D. student Fabian Rosner (1st Photograph: 1st from left) from the University of California, Irvine Advanced Power and Energy Program (UCI/APEP) traveled to the Chinese Academy of Sciences (CAS) in Beijing in support of the CERC-WET Project 1.3 collaboration on advanced integrated gasification combined cycle (IGCC) technology and water recovery systems. UCI/APEP and CAS are studying advanced technologies for integration into IGCC power plants and off -design gas turbine modelling for syngas applications to substantially enhance high efficiency energy conversion and water use reduction. 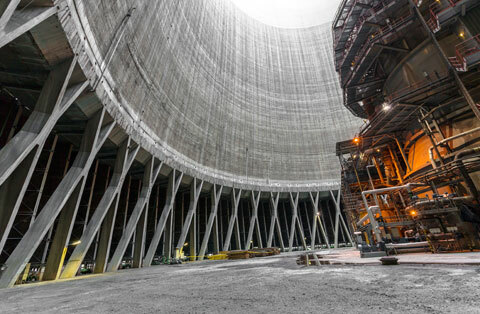 To further improve water use efficiency at thermal electric plants, approaches for active flue gas water recovery are also under investigation. Principal Investigators at UCI/APEP are Professor Scott Samuelsen and Dr. Ashok Rao. Fabian is shown in the photographs joining CAS PI Professor Lifeng Zhao (1st Photograph: 2nd from right) and CAS colleagues (Dr. Wang, 1st Photograph: 2nd from left; Dr. Zhang, 1st Photograph: 3rd from the left; Dr. Lei, 1st Photograph: 3rd from the right; Xin Zheng,1st Photograph: 1st from right) in a teleconference with UCI/APEP during his visit. 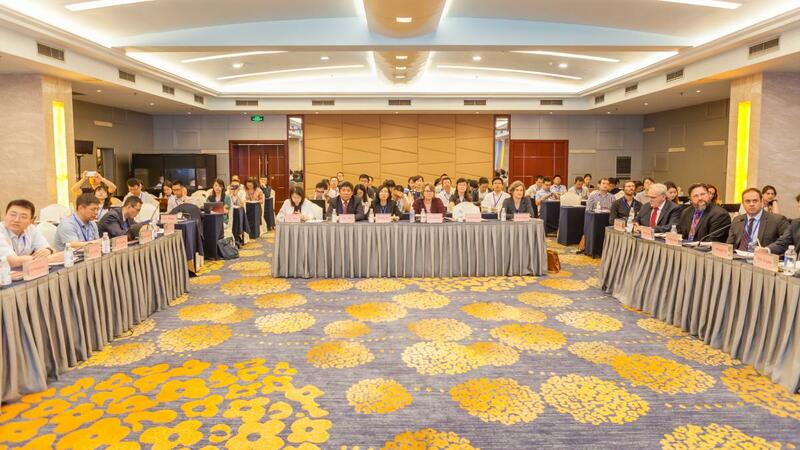 The Third Annual meeting of CERC-WET was held in Chengdu, China, for June 5-6, 2018. CERC-WET researchers and staff from U.S. team and Chinese team gathered and listened to the progress of their topics, and discussed the next steps for project development and future collaboration. All CERC-WET researchers and staffs from U.S. team and Chinese team who attended the annual meeting. CERC-WET researchers and staffs from U.S. team and Chinese team listening to topic progress report. 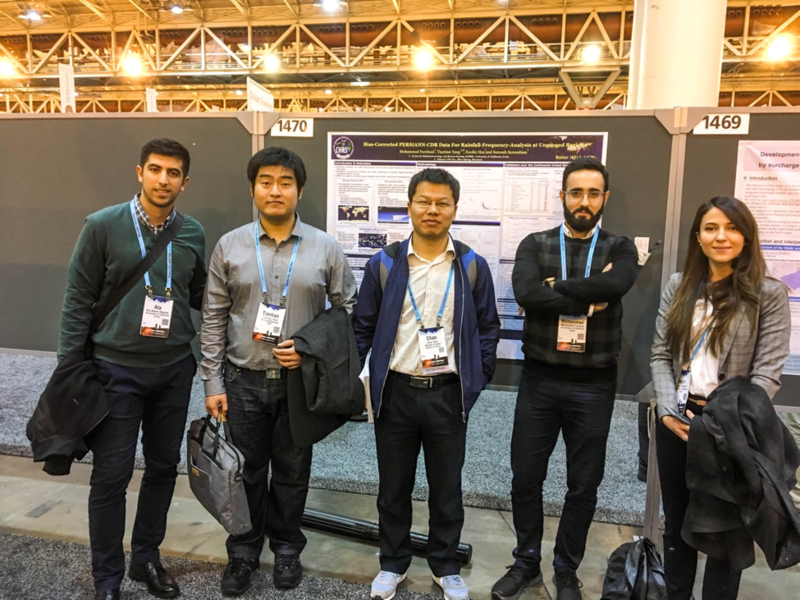 During the 2017 American Geophysical Union (AGU) Annual Conference in New Orleans from Dec-11 to Dec-15, 2017, CERC-WET researchers, students, and projects PIs from both U.S. and China teams under topic area 3 and 4 had fruitful technical discussions and collaboration meetings. 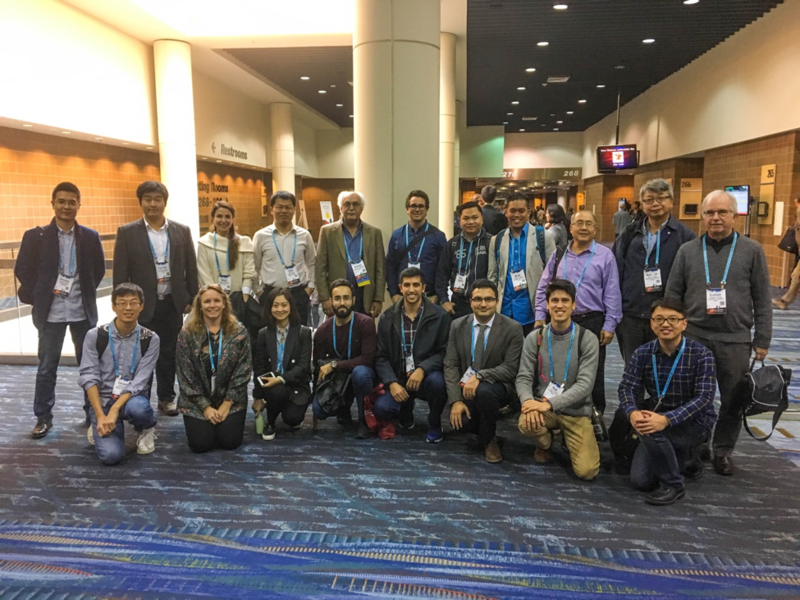 Many graduate students funded by CERC-WET have participated the 2017 AGU annual meeting, and presented their on-going research to the scientific community and Chinses collaborators. 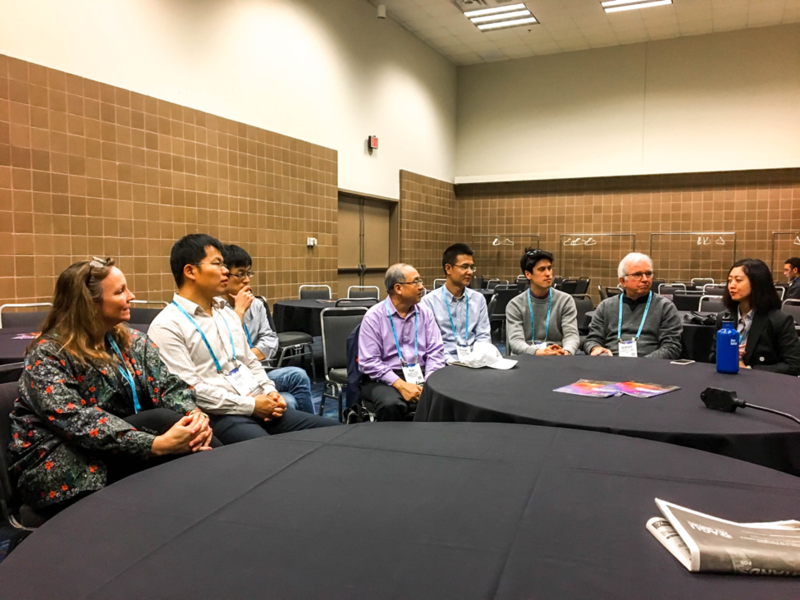 Special sessions with the focus of Water-Energy Nexus and Climate Variability and CERC-WET collaboration meetings were organized by CERC-WET researchers during the AGU meeting. 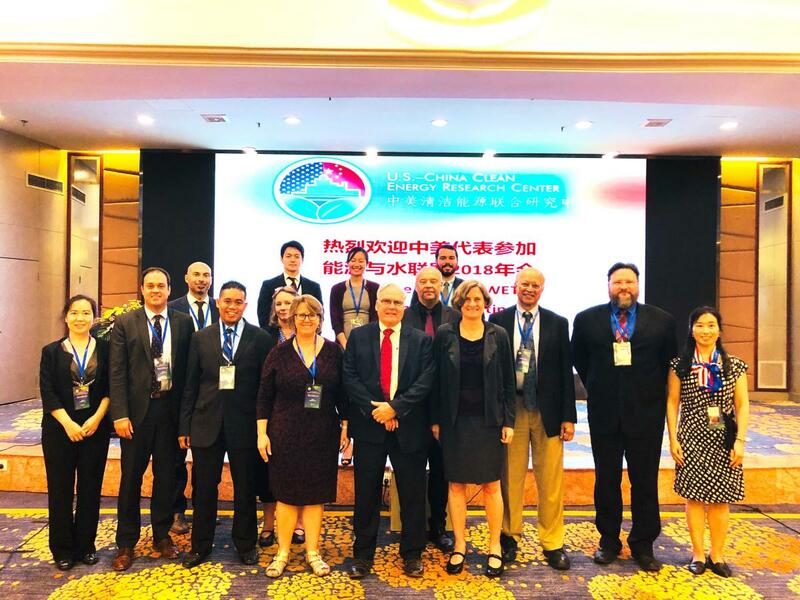 The U.S. CERC-WET executive director Carolyn Remick also participated the AGU meeting and connected with CERC-WET funded students, researchers, and Chinses partners from different institutes. 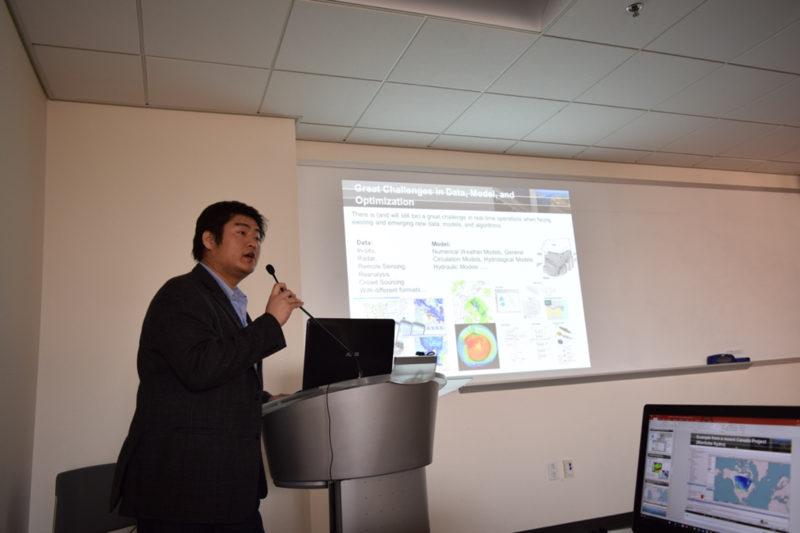 Mohammad Faridzad from UC Irvine (a U.S. CERC-WET funded graduate student) is giving a poster presentation about his on-going research under topic area 4 to the CERC-WET China Topic 4 lead (Dr. Chan XIAO from the China Meteorological Administration - National Climate Center). A good discussion is made during the in-person interaction with researchers from both U.S. and China teams with respect to the detailed scientific content and collaboration. A group photo of students, researchers, project PIs from both U.S. and China is taken after the CERC-WET gathering meeting during the AGU conference. A group photo is taken after the poster presentation given by CERC-WET funded students and researchers during the AGU Annual Meeting. (Left to right) Ata Akbari Asanjan (UC Irvine), Dr. Tiantian Yang (UC Irvine/ Deltares), Dr. Chan XIAO (China Meteorological Administration), Mohammad Faridzad (UC Irvine), and Negin Hayatbini (UC Irvine). 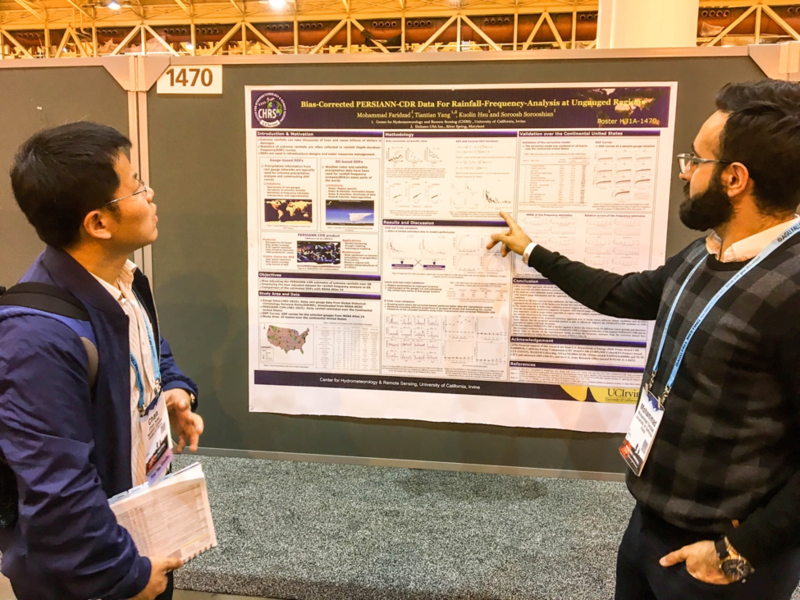 A graduate student funded by CERC-WET under Topic Area 3 is giving an oral presentation regarding the optimization and reservoir operation management in the AGU 2017 annual conference. (Left to Right) Matin Rahnamay Naeini (UC Irvine), Dr. Tiantian Yang (Deltares/UC Irvine), Prof. Chiyuan Miao (BNU), Carolyn Remick (UC Berkeley). 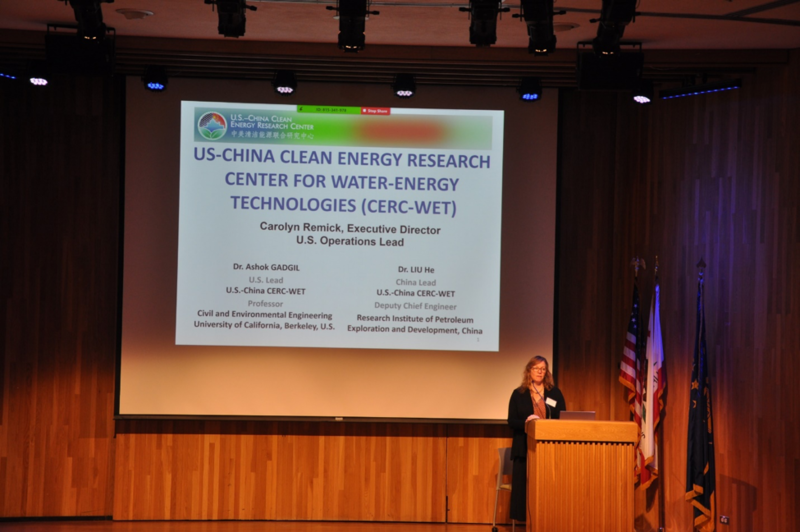 A U.S.- China CERC-WET conference was held on December 7-8, 2017 at the University of California Irvine. A China Delegation of 15 people came to UC Irvine for the conference and workshop. The delegation consisted of engineers, researchers and project PIs from China Meteorological Administration (CMA) - National Climate Center (NCC), the Institute of Hydropower Research and Water Resources (IWHR), Wuhan Regional Climate Center, and the Chinese Academy of Sciences. Productive discussions took place among researchers, students and project PIs under CERC-WET topic areas 3 and 4. A series of technical presentations from both U.S. and China teams were also given during this visit. 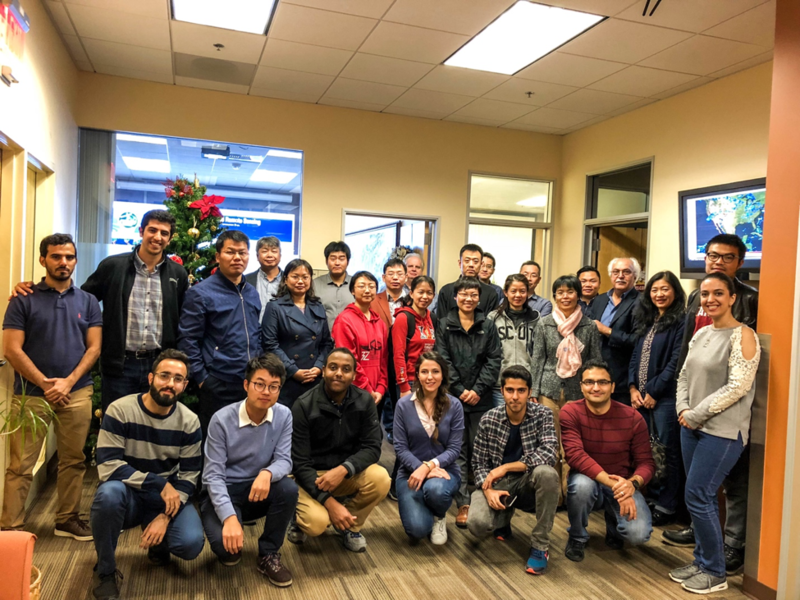 A group photo of students, researchers, and project PIs from both the China Delegation, and the Center for Hydrometeorology and Remote Sensing (CHRS), at the University of California Irvine. Dr. Chan XIAO (CMA/NCC) is giving a presentation to graduate students, researchers, and project PIs during the seminar conference on the topic of climatic change and its impacts on water resources and hydropower assets of China. 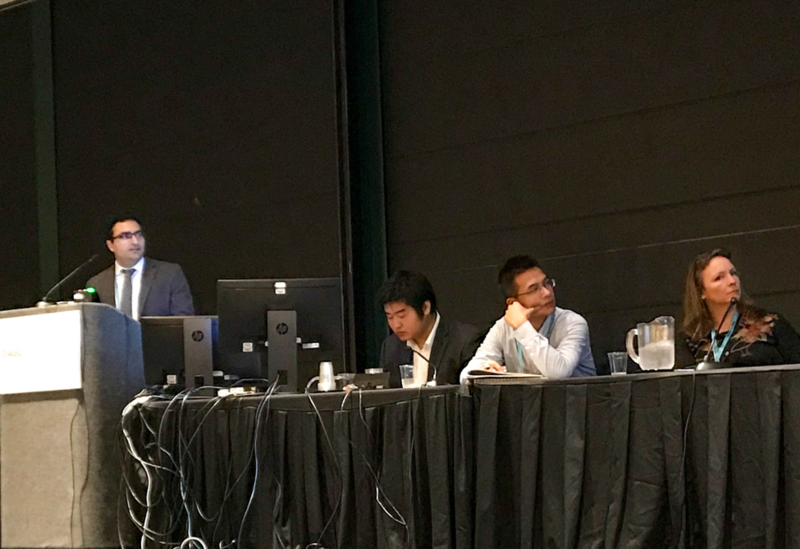 Dr. Tiantian Yang (Deltare/UC Irvine) is introducing some advanced reservoir management and hydropower operation tools to graduate students and Project PIs of UC Irvine, and researchers, engineers, and Chinese CERC-WET project PIs during the conference. 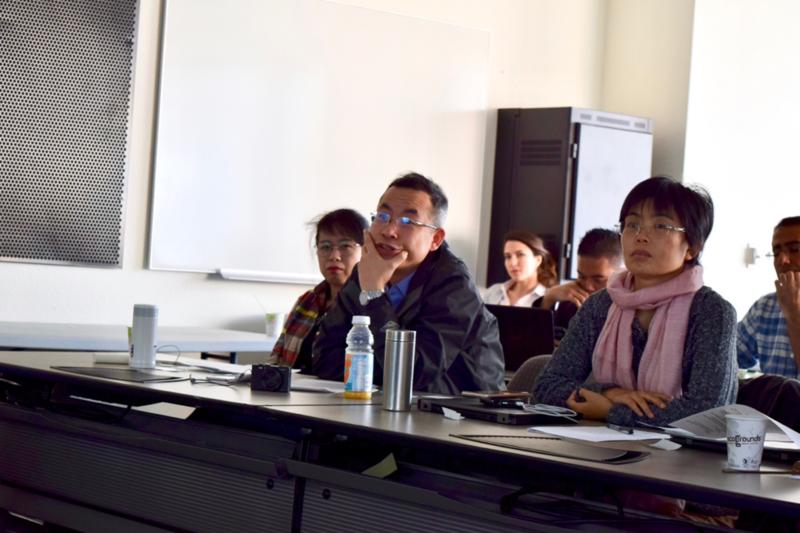 The researchers from China Meteorological Administration National Climate Center (front) and students (Back) from UC Irvine are enjoying the presentations given by both of U.S. and China CERC-WET team topic leads and researchers under topic areas 3 and 4. 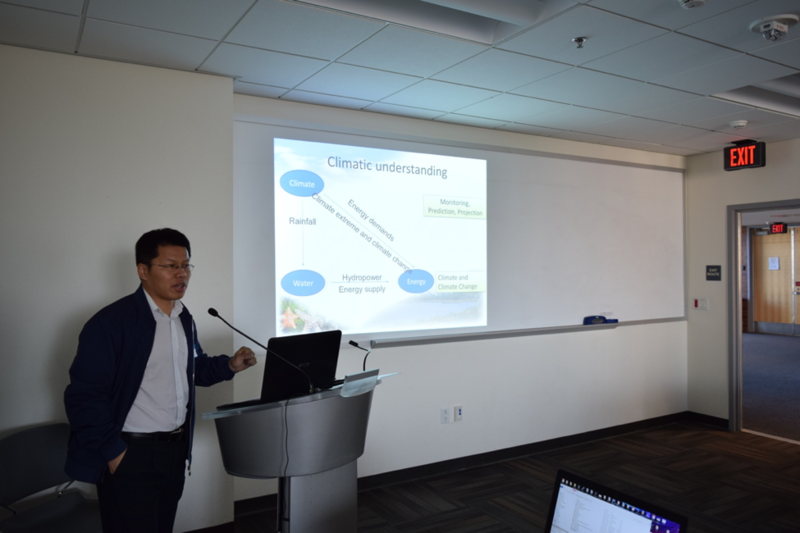 The scientist from Wuhan Regional Climate Center (Dr. Liangmin DU) is discussing with U.S. CERC-WET researchers about potential applications of the research outcomes from CERC-WET topic areas 3 and 4. Our first successful Industrial Affiliates Board meeting was hosted on the UC Berkeley campus on November 17, 2017. 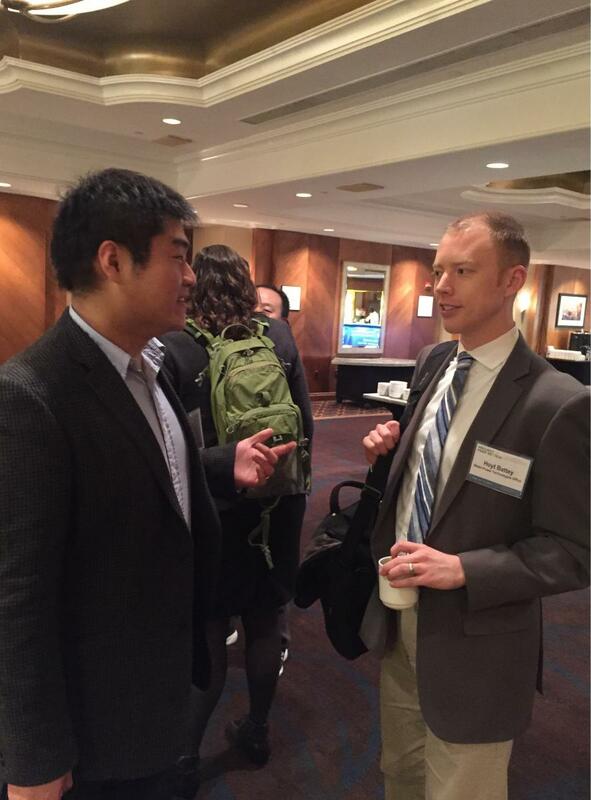 Many of our own CERC-WET faculty and students were in attendance to present and discuss their current research. Along with our own industrial board members many potential partners from energy corporations, environmental groups and utility companies attended and engaged in discussing current interests in water-energy technology and policy. After the formal presentation of current CERC-WET research efforts, a lunch was held for all our guests to discuss the trajectory of our funded projects and the prospects for new projects under the CERC-WET initiative. Neil Kern from Duke Energy presenting on the benefits of partnering with CERC-WET teams on their research and development. Executive Director Carolyn Remick presenting on IP Protection and industrial partnership agreements. [Left to Right] Professor Samuelsen of UC Irvine, Sr. Engineer Yaofan Yi of Chevron and Dr. Tiantian Yang of Deltares USA attending the IAB 2017 Luncheon. 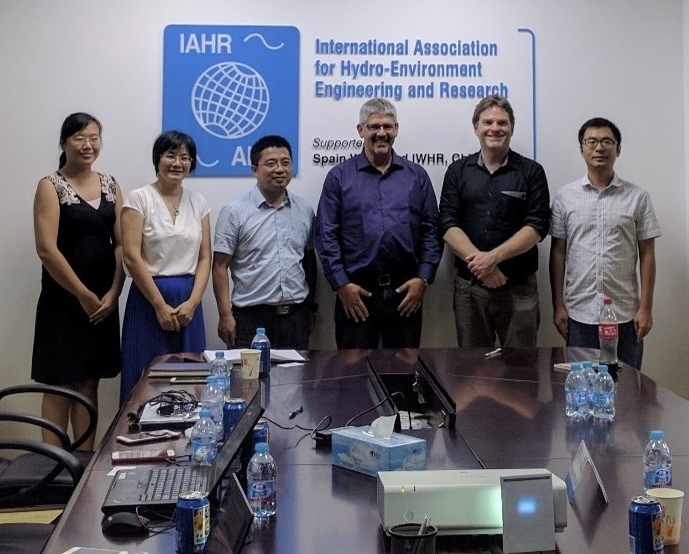 Professor Joshua Viers traveled to Beijing from August 8th to August 11th 2017 to meet with Chinese counterparts and approved researchers under the CERC-WET project in the IAHR (International Association for Hydro-Environment Engineering and Research) and IWHR (China Institute of Water Resources and Hydropower Research). During this trip, they presented research and attended presentations by CERC-WET counterparts. They identified potential areas of collaboration and future steps in building new research relationship. From August 14th to August 18th 2017, this same group attended the IAHR International Congress in Kuala Lumpur Malaysia, where they were able to interact with many of the researchers from IAHR/IWHR community as well as the broader research community in water resources research. 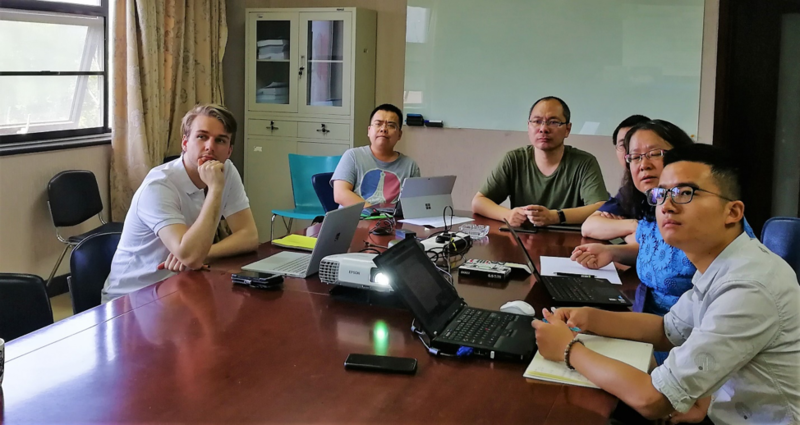 This past July, Ph.D. student Fabian Rosner (1st Photograph: 2nd from right) from the University of California, Irvine Advanced Power and Energy Program (UCI/APEP) visited Chinese partners at the Chinese Academy of Sciences (CAS). 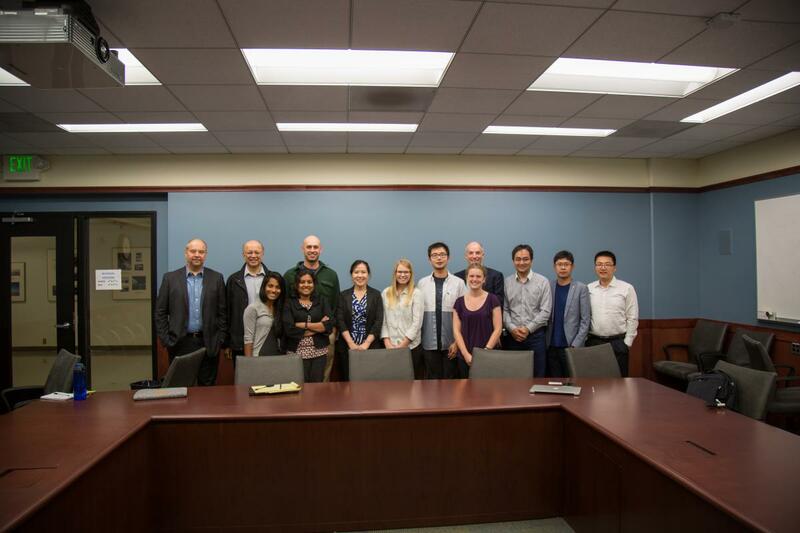 Together with a research group at CAS, led by Prof. Xiao (1st Photograph: 3rd from left) and Prof. Zhao (1st Photograph: 2nd from left), UCI/APEP is addressing water use reduction at thermoelectric plants. 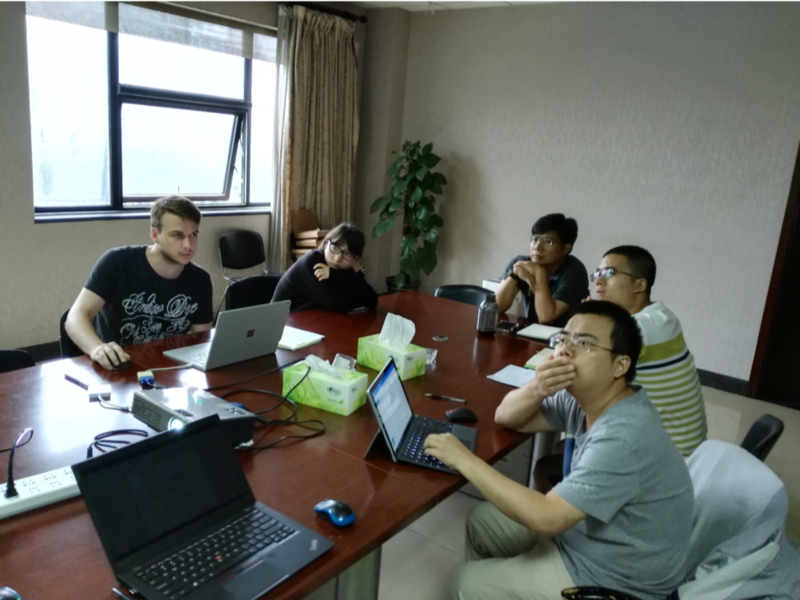 During his 3-week stay, Fabian closely collaborated with Dr. Wang (1st Photograph: 1st from left) and Ph.D. student Xin Zheng (1st Photograph: 1st from right) on model development and plant integration strategies for water use reduction in integrated gasification combined cycle applications with combined wet/dry cooling systems. The detailed analyses of modeling approaches and plant integration schemes, and the development of a reference case to compare modeling results between the two institutions, improved the understanding of these complex systems and further strengthened the foundation for the collaboration. 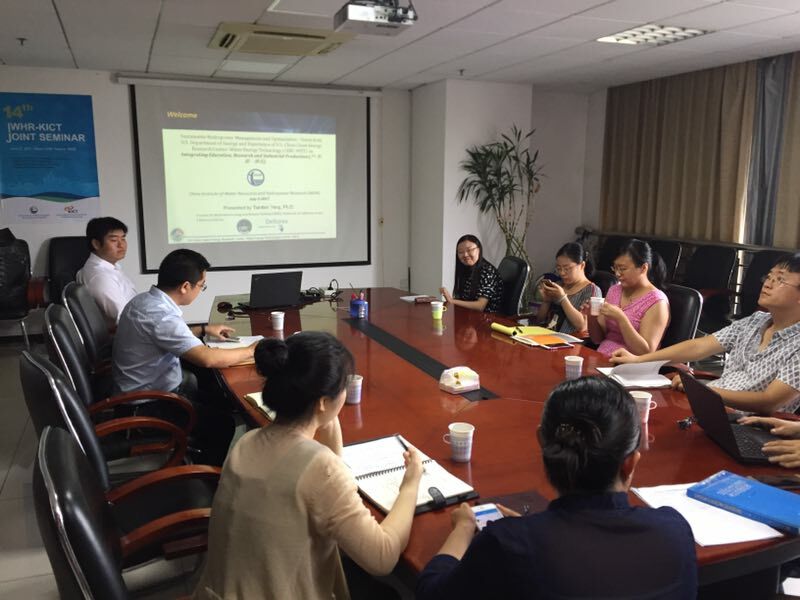 Under Topic Area 3, Dr. Tiantian Yang from UC Irvine/ Deltares visited China Institute of Water Resources and Hydropower Research (IWHR). 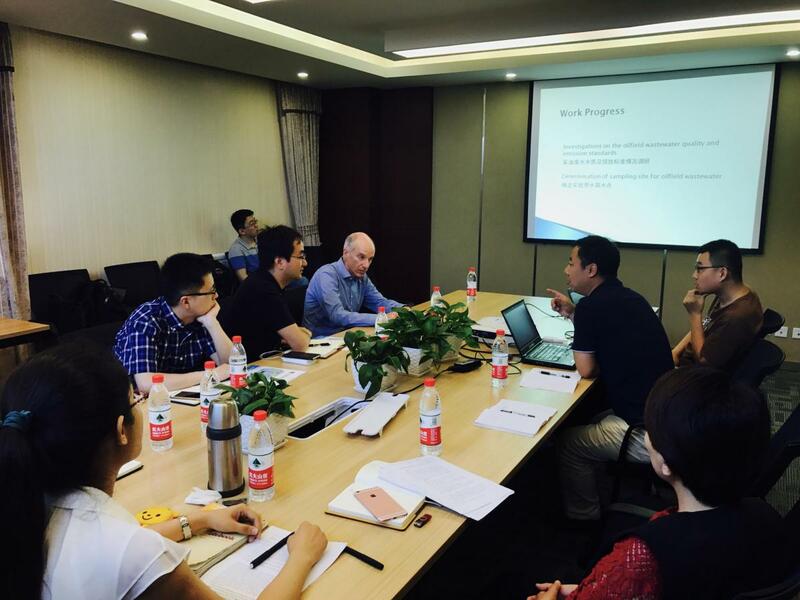 Good discussions have been made among Dr. Tiantian Yang (first top-left), China Topic 3 Lead - Dr. Qidong PENG (second top-left), and researchers at IWHR with regards to the technical content and collaboration plans under Topic Area 3. 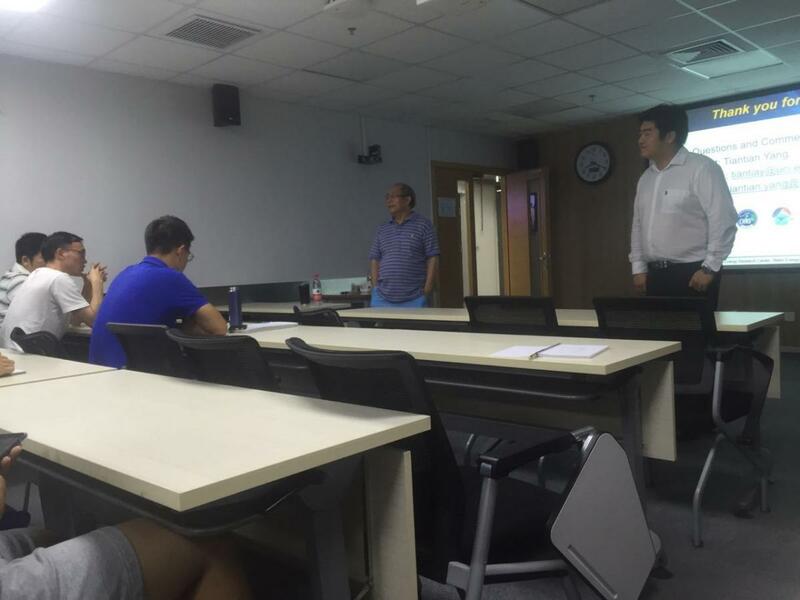 Dr. Tiantian Yang from UC Irvine / Deltares was invited to give a seminar talk at Beijing Normal University, College of Global Changes and Earth System Sciences on the topic of Sustainable Hydropower Management and Optimization and the integration of education, research and industrial production under the CERC-WET consortium. China CERC-WET Project 3.3 lead Prof. Qingyun DUAN (middle) from the Beijing Normal University and Dr. Tiantian Yang (right) from UC Irvine / Deltares are discussing the advances and challenges of forecast uncertainties, optimization theory and reservoir operation with graduate students and researchers at Beijing Normal University. 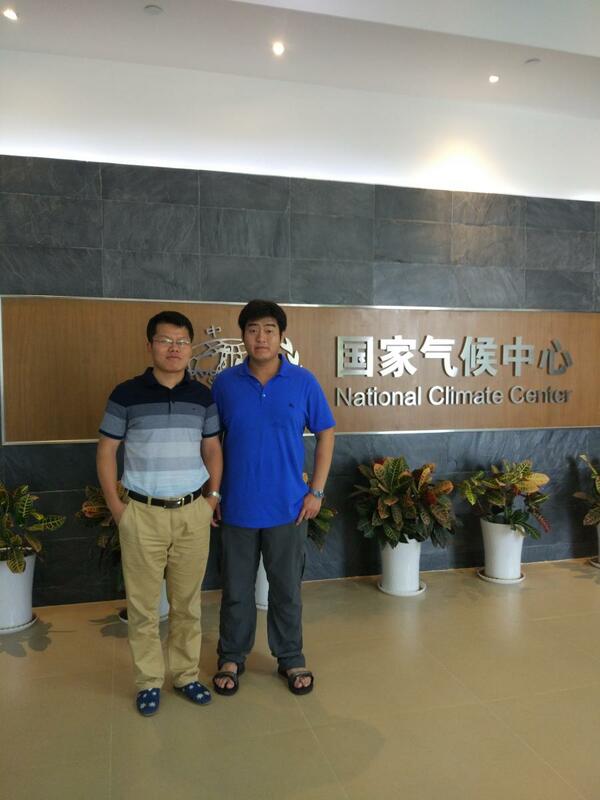 After a technical discussion of the collaboration under the U.S. and China CERC-WET Topic Area 4, a photo was taken at the front door of National Climate Center (NCC) of the China Meteorological Administration (CMA). Left: China CERC-WET Topic 4 lead- Dr. Chan XIAO from CMA-NCC. Right: Research Representative - Dr. Tiantian Yang from both UC Irvine and Deltares. 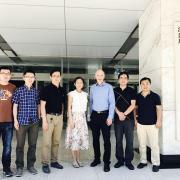 Leader of US-side for CERC-WET Topic 2, Prof. David Sedlak, visited colleagues at the Institute of Seawater Desalination and Multipurpose Use (SDMU) of the State Oceanic Administration (SOA) of China, in Tianjin, on 23 May 2017, accompanied by Dr. Quinghai Yang of RIPED, lead institute from China of CERC-WET. Photos show the visitors to SDMU and their host scientists in SDMU. 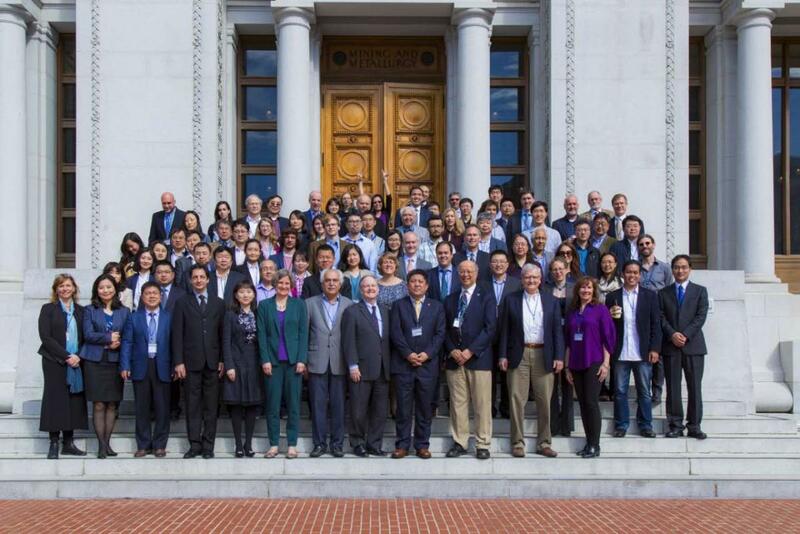 The U.S.-China Clean Energy Research Center for Water Energy Technologies (CERC-WET) co-sponsored the fourth Chinese Environmental Scholars Forum with the Environmental and Earth Sciences Area (EESA) at Lawrence Berkeley National Laboratory (LBNL). 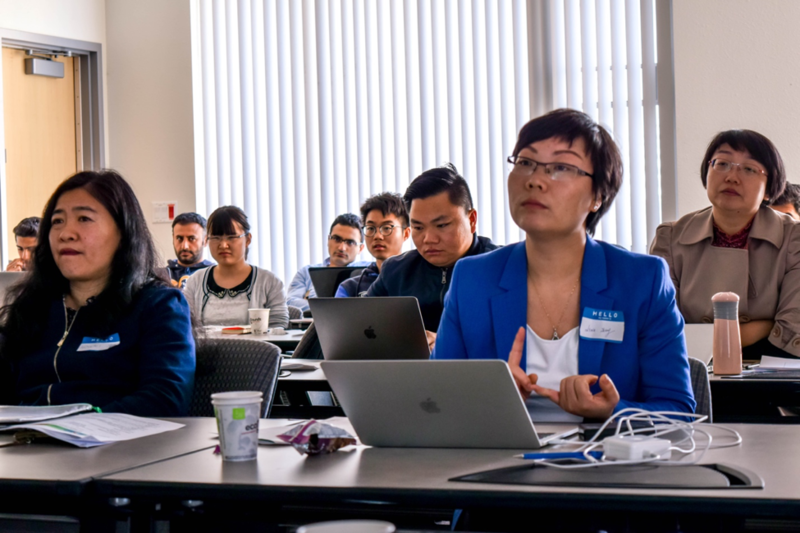 On May 20th and 21st, over one hundred scholars from more than fifty different universities and institutions participated in the fourth Chinese Environmental Scholars Forum at Berkeley. With a global perspective and a special focus on China, this forum is dedicated to providing scholars who work on sustainability-related research with an inclusive platform for open, equal and free idea exchange, professional networking, and interdisciplinary collaborations. 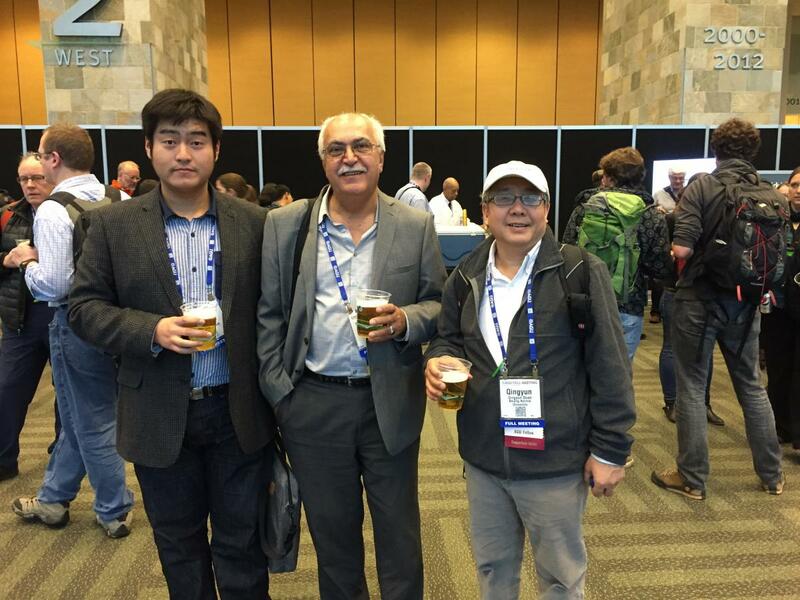 This year, the organization of the forum was led by young scholars at LBNL and UCB, including Xuejing Yang and Zexuan Xu from CERC-WET. In this two-day event, over thirty oral and poster presentations were given by young scholars on four focus areas: (1) Hydroclimate, Water Resources and Big Data, (2) Water-Energy / Carbon-Water Nexus, (3) Water Pollution and Remediation, and (4) Environmental and energy policy. Executive Director Carolyn Remick introduced the research scope and potential collaborative opportunities of CERC-WET at the forum, and several scientists affiliated with CERC-WET joined young scholars in conversations and discussions on a variety of topics. Executive Director Carolyn Remick indroducing the CERC-WET project at Bechtel Engineer Center, UC Berkeley. 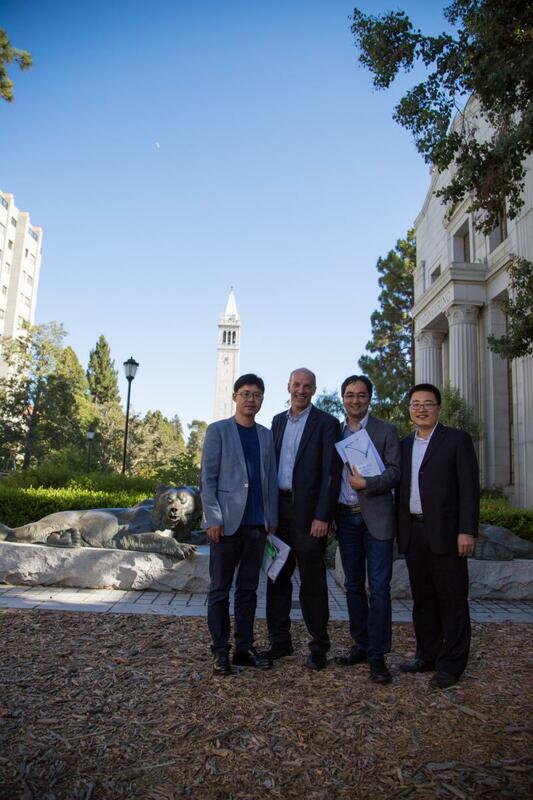 Our second successful annual meeting with our Chinese leadership and colleagues was hosted on the UC Berkeley Campus in Berkeley, California. This is the first time that this conference has taken place in the United States and was attended by over 100 members of the U.S. CERC-WET projects throughout China and the U.S. 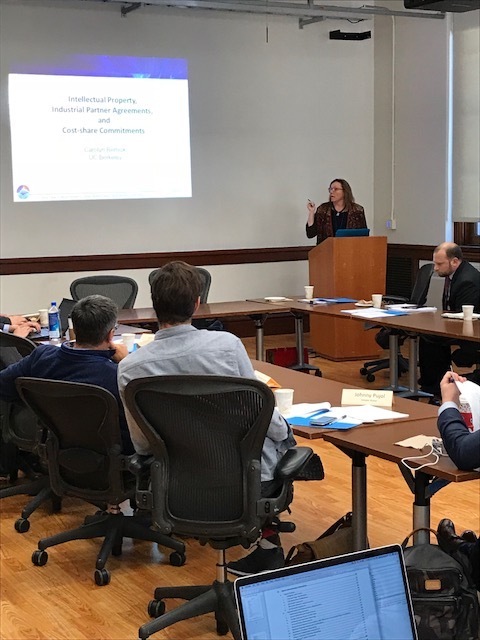 In addition to our researcher institutions, members of the United States Department of Energy, the University of California Office of the President, the California Energy Commission and industrial representatives attended and provided presentations. During these two days, members of all five topic areas were able to meet, discuss their collaborative research and ten point plans, and develop plans for travel and student involvement. These breakout sessions were held throughout the various halls of the College of Engineering, while the main presentations were held in the historic Hearst Memorial Mining building which sits as the backdrop to this year's group photo (Photo 1). 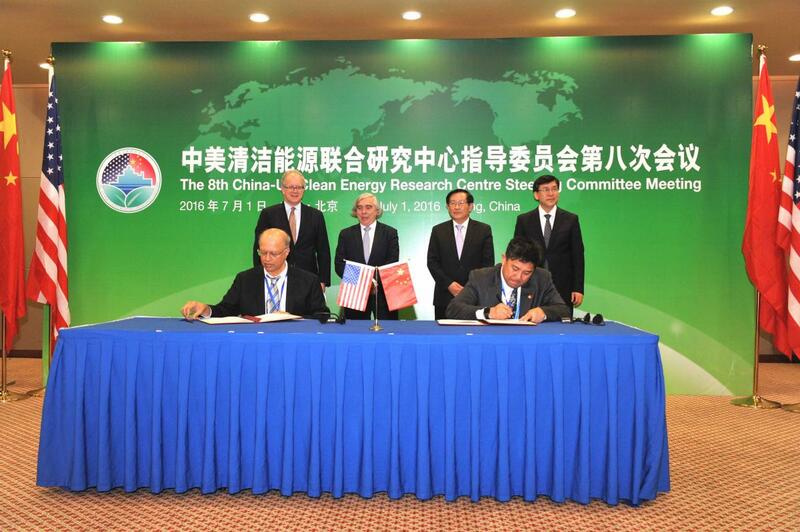 The CERC-WET project is excited to continue our work on the nexus between water and energy with invigorated support from the US Department of Energy and China's Ministry of Science and Technology. As we move forward with 2017, we are focusing on developing further research connections between projects and topic areas while planning for future workshops and webinars showcasing technology development. Presentation slides from this conference can be found below and in the Events Column of the website under the Past Events section. 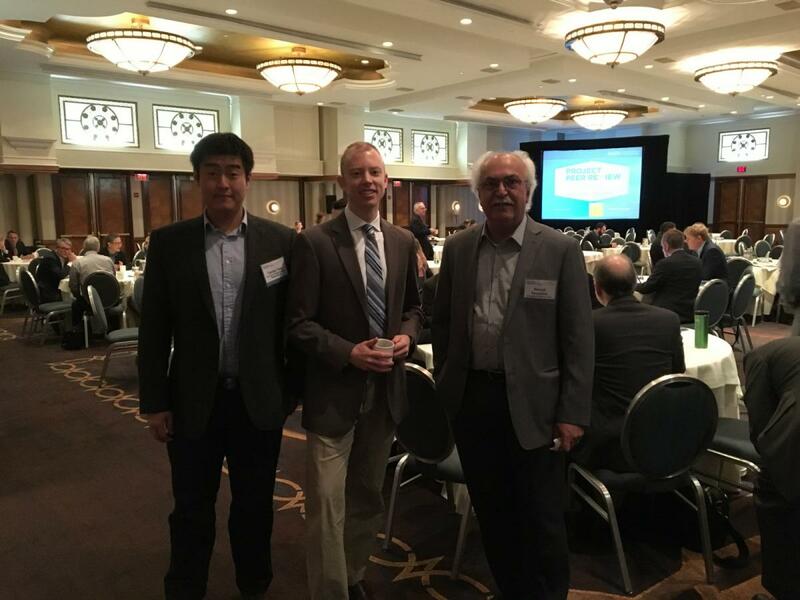 Prof. Sorooshian and Dr. Tiantian Yang (both of UCI) traveled to Washington D.C. to present project overview and answer questions at the Annual Peer Review of projects supported by the U.S. DOE's Wind-Energy and Water-Power Technologies Office. CERC-WET Topic-Area-3 Projects were presented by Professor Soroosh Sorooshian of UC Irvine, the leader of this Topic Area ("Improving Sustainable Hydropower Design and Operations"). 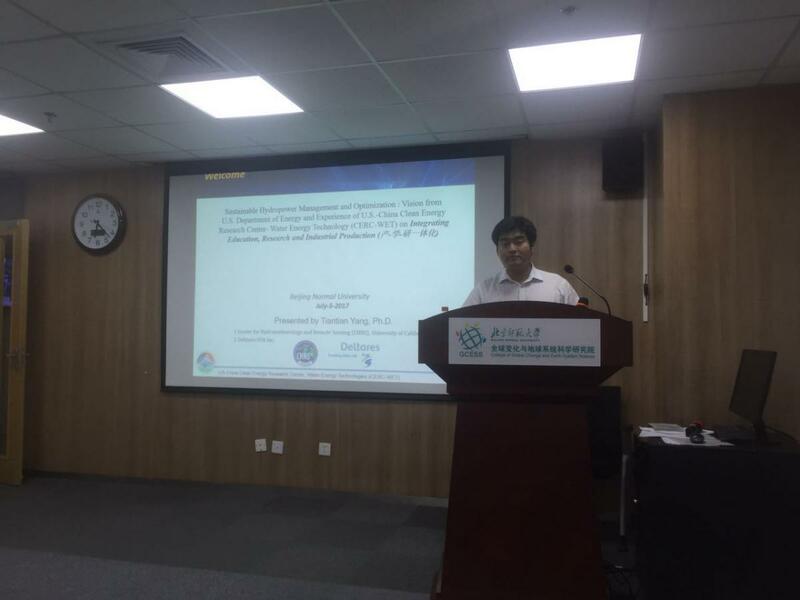 The aspects of Topic Area #3 projects that were presented were the relevance to water industry, their technical accomplishments, research collaboration with technology transfer, and proposed future research. Overall, the presentation was well received by the Peer Review Panel, which expressed interest in future progress of this research. Topic Area 3 Lead Professor Soroosh Sorooshian from UC Irvine (right), Topic Area 3 Project Manager Hoyt Battey from the Water Power Technologies Office of DOE (middle), and Dr.TiantianYang from Deltares USA Inc. / UC Irvine (left) are taking a group photo after the meeting opening remark. Professor Soroosh Sorooshian as the CERC-WET Topic 3 lead is presenting the research activities to DOE experts and panelists during the Peer Review Meeting. Good feedbacks are received. Dr. Tiantian Yang (left), as a reservoir scientist from Deltares USA Inc. and a researcher from UC Irvine, is discussing with DOE Project Manager Hoyt Battey (Right) about the importance of knowledge and technology transferring between Academia, Industry, and Stakeholders, as well as the expertises of Deltares USA Inc. and UC Irvine in support of the operation and management of water-energy system. 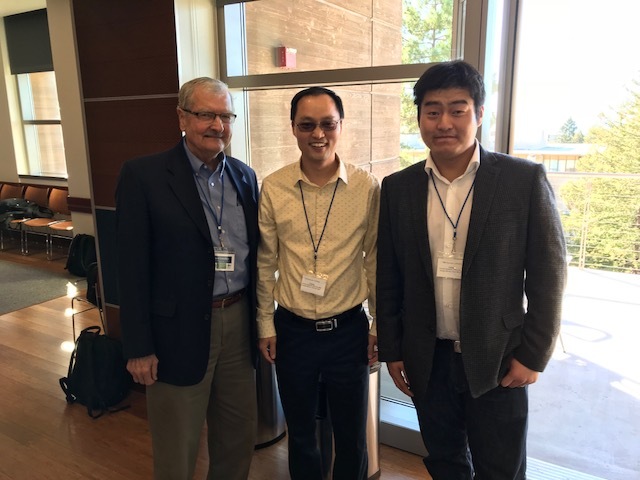 (left to right) Dr. Tiantian Yang (UC Irvine)Professor Soroosh Sorooshian (UC Irvine), and Professor Qingyun Duan of Beijing Normal University (right) met to discuss topic area 3 project goals. Agreements were made regarding their 10 Point Plans. 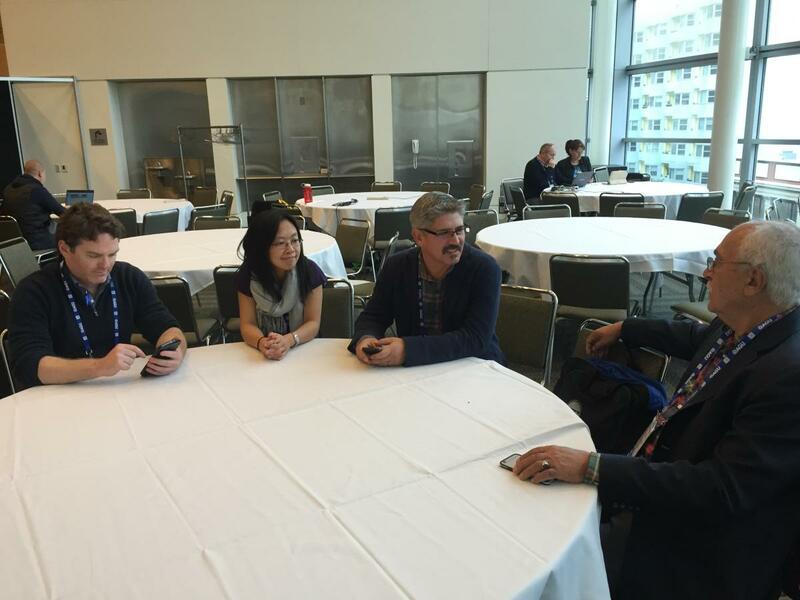 (left to right) Daniel Nover (UC Merced), Jenny Ta (UC Merced) Professor Josh Viers (UC Merced), and Professor Soroosh Sorooshian (UC Irvine) discussing research plans and administrative coordination for project 3.1. 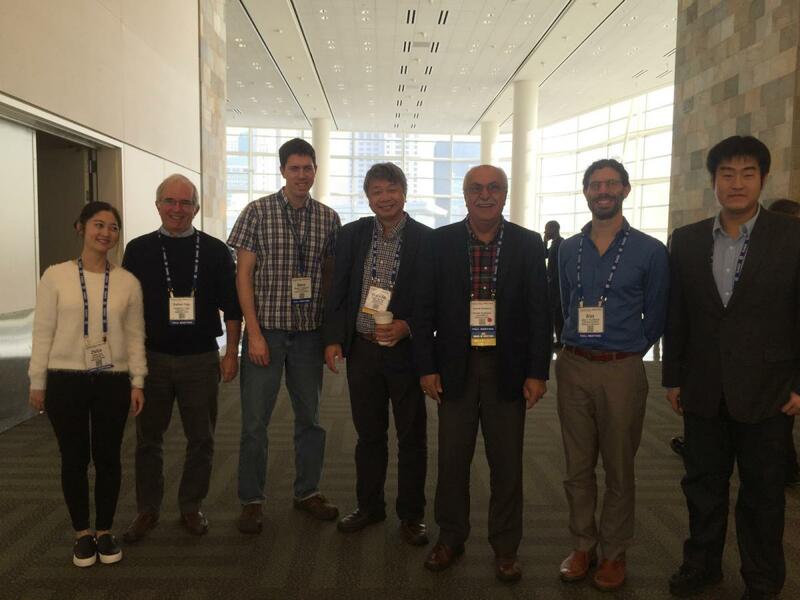 (left to right) Dr. Zhilin Guo (UC Davis), Prof. Graham Fogg (UC Davis), Prof. Steve Margulis (UCLA), Prof. Koulin Hsu (UC Irvine), Prof. Soroosh Sorooshian (UC Irvine), Dr. Alan Di Vittorio (LBNL), and Dr. Tiantian Yang (UC Irvine/ Deltares USA), taking a group photo following their discussion meeting on topic area 4 projects. 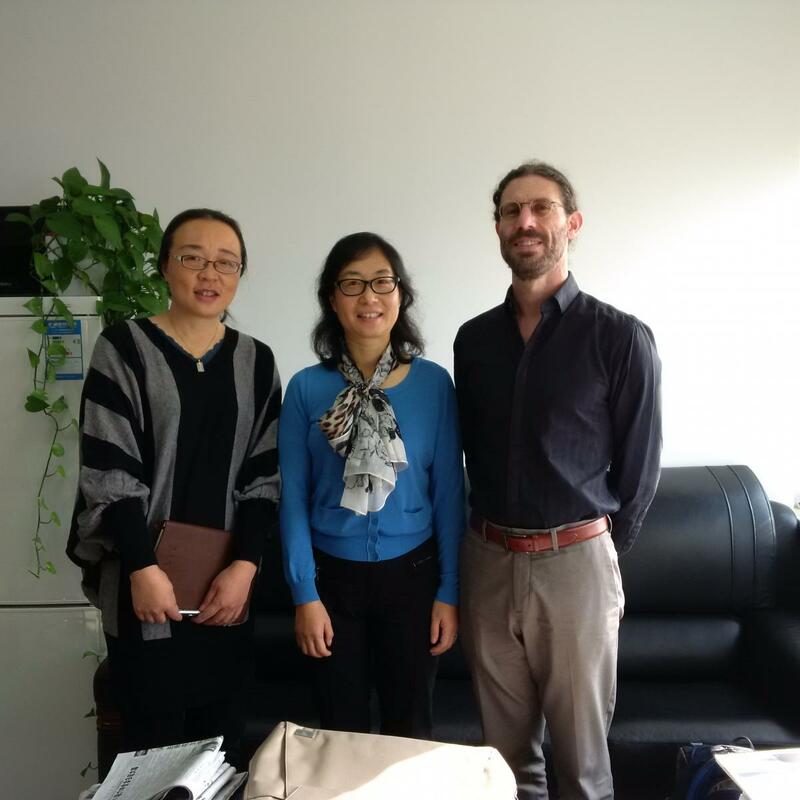 Topic Area 4 lead Alan Di Vittorio traveled to China to meet with the Deputy Diretor of the China National Climate Center (Dr. CHAO Qinchen, center) and the Director of operations for science and technology at the NCC (Dr. YAN Yuping, on the left). During his visit a meeting was held with Dr. XIAO Chan and Dr. XU Hongmei to discuss 10-point plans for various projects under Topic Area 4. 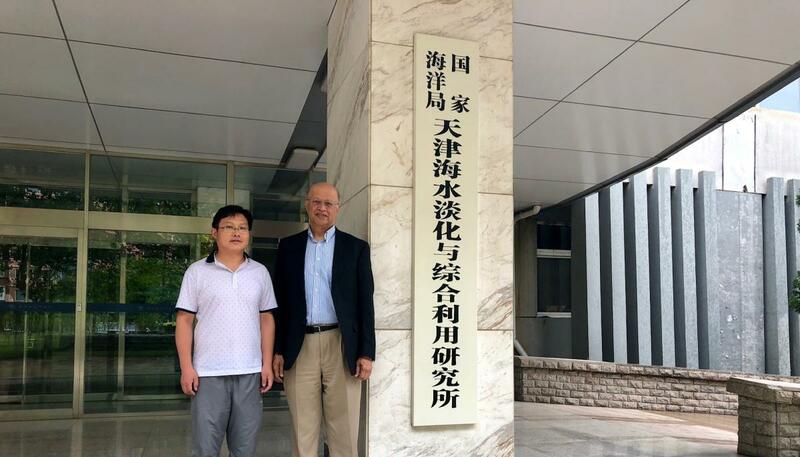 Other meeting members included Dr. ZHANG Jie of the Project 4.4 China team, and Dr. RONG Xinyao from the Chinese Acadamy of Meteorological Sciences, who will be doing surface hydrological modeling for Topic Area 4. 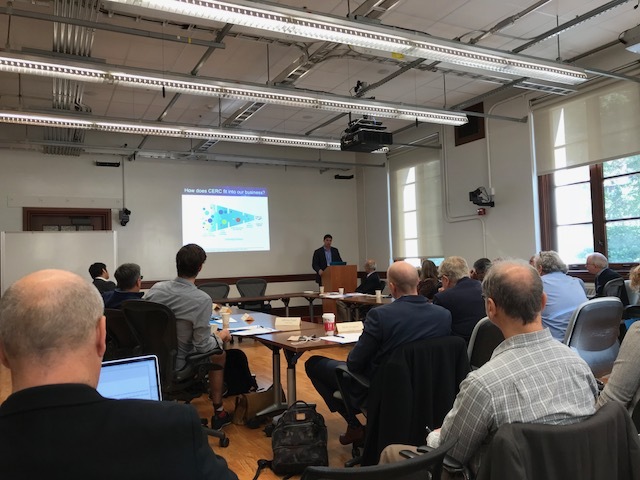 The first U.S. Stakeholders Meeting for CERC-WET was successfully hosted on the UC Berkeley campus on Friday, August 19, 2016. Members of the Department of Energy and the California Energy Commission were in attendance along with industrial representatives. All five topic areas were well represented by their principle investigators and student researchers. Presentations on the the U.S./China CERC program and the CERC-WET Topics Areas were given during the morning session, while panel discussions and breakout sessions with industrial representatives were held in the afternoon. 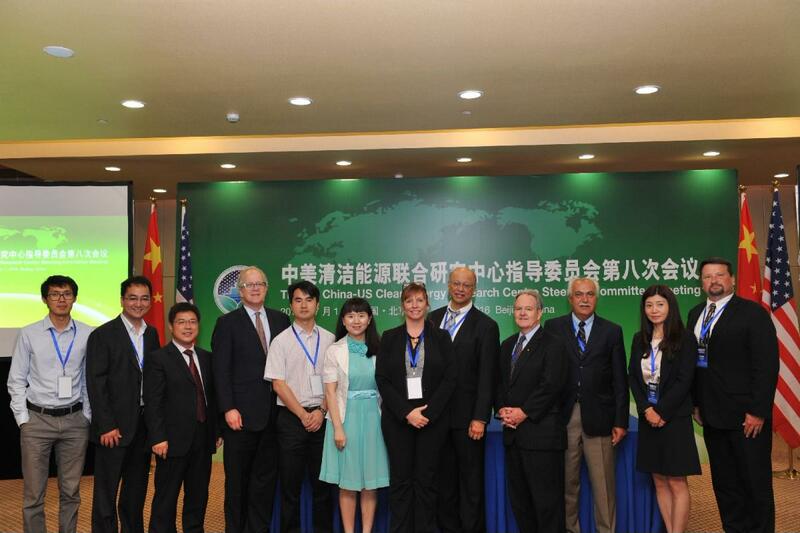 Director Robert Marlay of the U.S. Department of Energy's Office of International Science and Technology Collaboration is pictured in the first photo presenting the overview for the U.S./China Clean Energy Research Center program. 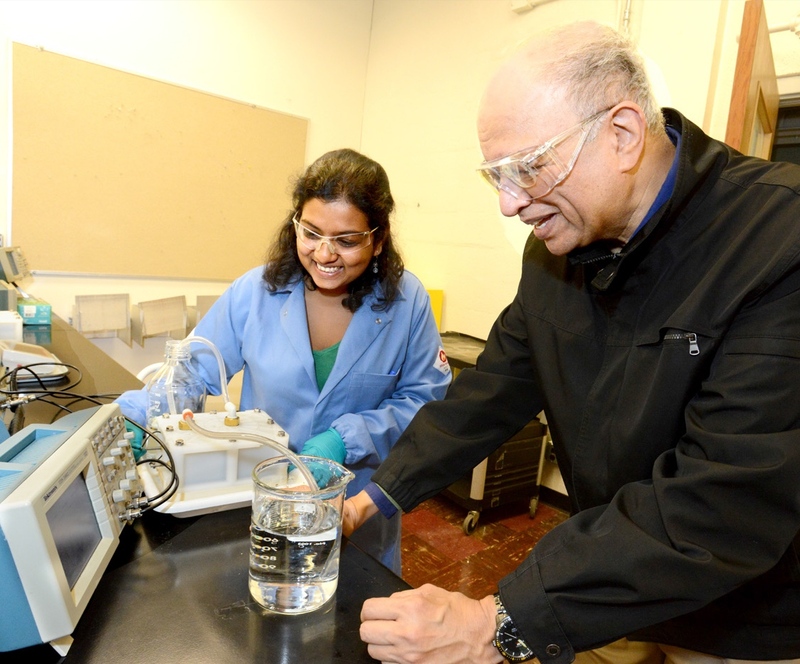 The second photo shows CERC-WET Director Ashok Gadgil presenting on the structure and organization of CERC-WET's campuses and research members. 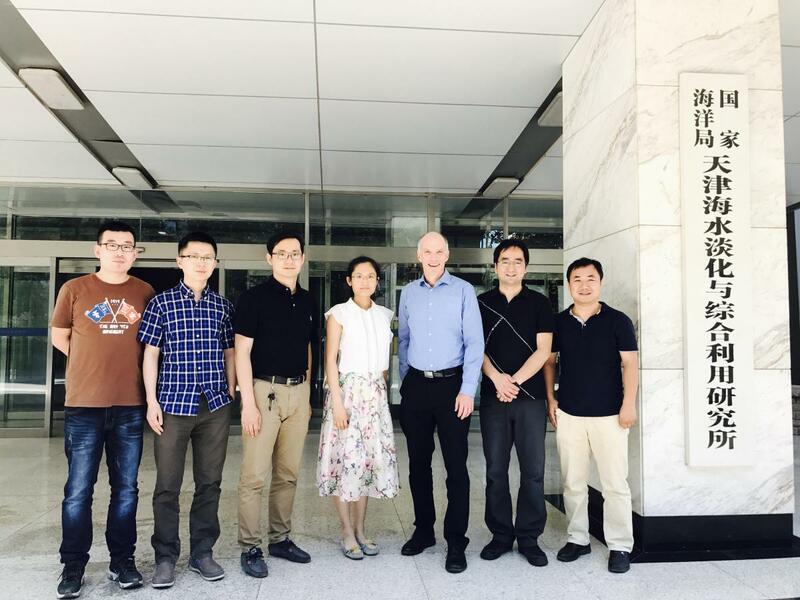 On August 9 and 10, 2016, our U.S. Topic Area #2 lead, Professor David Sedlak and a group of our Lawrence Berkeley National Laboratory researchers, lead by Dr. Jens Birkholzer, hosted a visit by China's Topic Area #2 lead, Dr. Qinghai Yang, and his colleagues Dr. Jia Deli and Dr. Xi Zu Yao. During their visit, Topic Area #2 researchers provided presentations of their current project work and planned the next phases of joint research. Tours were given, both at LBNL laboratories and of the UC Berkeley campus. This visit was the first of many visits which will bring both our U.S. and China teams together to establish further collaboration and joint work plans. The first photo pictures U.S and Chinese Topic Area #2 leads and researchers, while the second photo captures Professor David Sedlack and the China team in front of UC Berkeley's iconic Sather Tower. 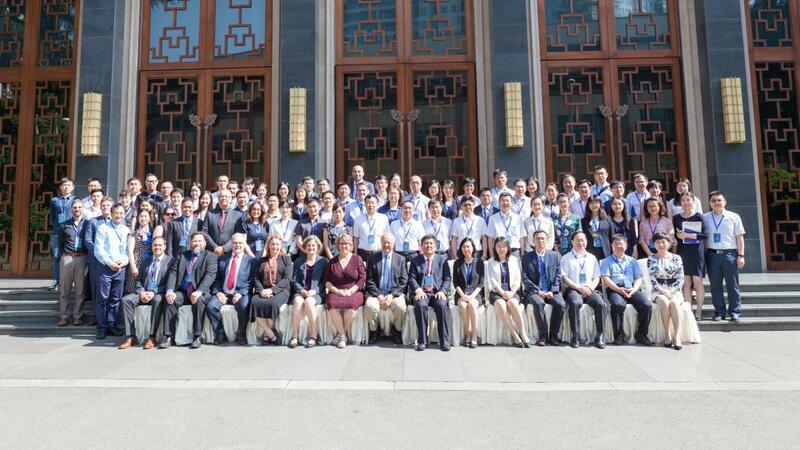 The 8th Annual Steering Committee Meeting of the US-China Clean Energy Research Centers (CERCs) was held in Beijing, China with participation from the leaders of all CERC projects, leaders of the US Department of Energy, China's Ministry of Science and Technology, and representatives from select US and China industry partners. 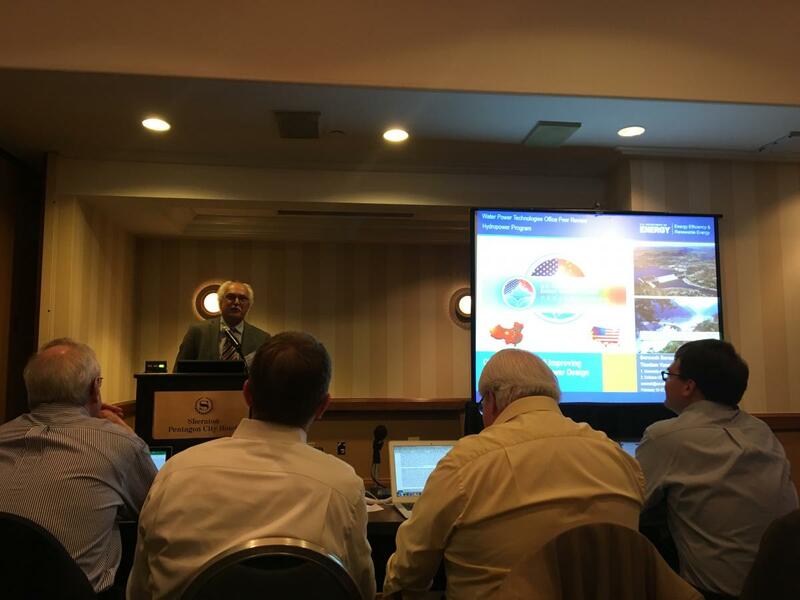 The leaders of U.S. and China CERC-WET teams jointly presented the progress of their project lineups for the remainder of 2016 and start of 2017. China CERC-WET Director Prof. Liu He and US CERC-WET Director Prof. Ashok Gadgil are pictured in the first photo, jointly presenting CERC-WET's project structure to the Steering Committee members and the audience. The second photo shows members of DOE and members of the U.S. and China CERC WET management teams, while the third photo captures Director Prof. Ashok Gadgil and Director Prof. Liu He signing both the Joint Work Plan and Technology Management Plan for the U.S.-China CERC-WET projects. 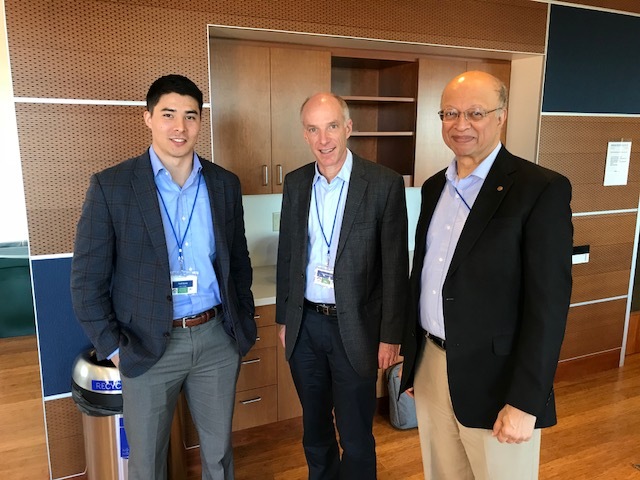 The US Ambassador to China, Max Baucus, visited Lawrence Berkeley National Laboratory (LBNL) on March 10, 2016, and listened to a presentation of the CERC-WET projects by Center Director Ashok Gadgil. 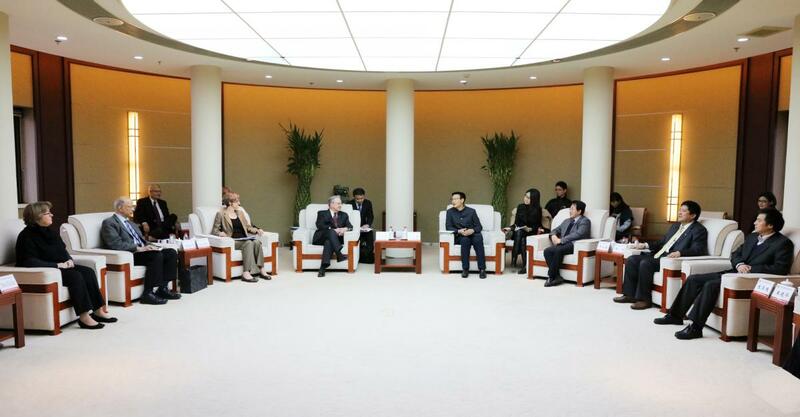 Ambassador Baucus showed interest in the specifics of the projects and expressed support for the increased collaboration between the US and China research teams. 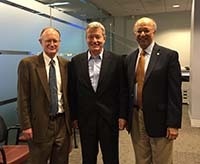 Photo shows LBNL Director Mike Witherell, Ambassador Max Baucus, and Prof. Ashok Gadgil (L to R). Our first meeting with our China counterparts were hosted by the Research Institute for Petroleum Exploration and Development (RIPED) campus in Beijing. RIPED is the research institute of the Chinese National Petroleum Corporation (CNPC), the parent of the fourth largest company in the world, PetroChina. RIPED is the Chinese counterpart to the University of California as the lead institution in the China consortium of CERC-WET. (Please see some of the attached photos from our meeting). Our presentations and discussions were fruitful in defining the next steps for each of the 5 Topic Areas (also listed on our website). The meeting provided us the opportunity to start collaboration on our joint work projects. Addditionally, our Chinese Consortium expressed strong interest in welcoming demonstrations of industry technology for their particular project areas. In light of these interests, we are currently working to finalize our Technology Management Plan (TMP) in order to protect the IP alignments for both Chinese and American industry partners. Once the TMP is in place, we will be able to welcome additional industry partners to join the CERC-WET consortia in the US and China.